U.S. Vice President Mike Pence speaks with a Japanese officer as he inspects a PAC-3 interceptor missile system with Japanese Defense Minister Itsunori Onodera, Tokyo, Feb. 7, 2018 (AP photo by Toru Hanai). On March 27, Japan announced an extensive reorganization of the main branch of its military, known as the Ground Self-Defense Forces. The government described it as the most sweeping revamp since the forces were founded in 1954. The restructuring includes integrating the five regional armies that make up the Ground Self-Defense Forces under a single command. While Japan’s postwar constitution restricted the country’s military capabilities, escalating threats from China and North Korea have raised concerns for Tokyo, and Prime Minister Shinzo Abe has taken steps to loosen the constitutional constraints. 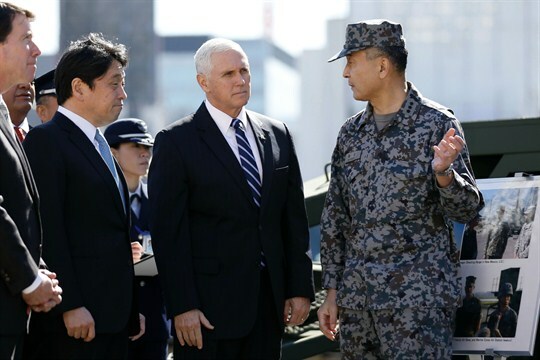 In an email interview, Michael Green, the senior vice president for Asia and the Japan chair at the Center for Strategic and International Studies in Washington, discusses Japan’s military revamp and the implications for its security alliance with the United States.